Walnuts are considered the food of the Gods, for their fruit reminds the shape of the human brain. In addition, they are a natural product containing no cholesterol. 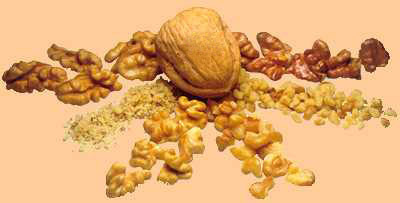 You can find Inshell and Shelled walnuts in the market. Inshell walnuts continue being very demanded but recently the consumption of shelled walnuts is constantly increasing in the European markets meanwhile are going on supplying the specific needs of industries as pastry, bakery and ice-cream factories. Since 1980 until 2007 we were representing all over Spain, including The Balearic and Canary Islands, to the most powerful producer of California walnuts in the world, Diamond Walnut Growers as a cooperative of cooperatives first and after Diamond Foods as a public Company. And we continue working with the best California walnuts packers and exporters to cover the needs of our customers. The top inshell walnuts varieties are Hartley, Vina and Eureka, always US1 product, being Jumbo and Large the more usual calibers. 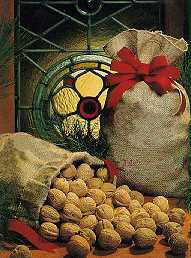 With regard to shelled walnuts, there are also several varieties like Payne, Serr and Chandler that can be vacuum packed. Since many years ago we are selling in Spain the best shelled walnuts from India, in different qualities as Light Halves, Light Broken, Light Amber Broken and so on. Always vacuum packed to protect its quality and taste during all the year. This country is providing us with walnuts of very good quality, white and good taste, that makes we deal a higher volume year after year. Inshells that can be bleached and natural, Serr, Eureka, Vina and Sunland varieties in several calibers. The shelled in Halves, Halves and Broken, Big Broken Extra Light, Light and Light Amber and also Medium and Mini Light Broken. Packed in modified atmosphere bags that guarentee their best long-lasting life.